Definition at line 464 of file commdlg.h. Definition at line 470 of file commdlg.h. Referenced by DIALOG_FilePrint(), Display_OnPrint(), CMainWindow::OnCommand(), PRINTDLG_ChangePrinterA(), PRINTDLG_CreateDCA(), PRINTDLG_GetDlgTemplateA(), PRINTDLG_UpdatePrintDlgA(), PRINTDLG_WMCommandA(), PRINTDLG_WMInitDialog(), PrintDlgA(), PrintDlgProcA(), PrintRegistryHive(), test_abort_proc(), test_DeviceCapabilities(), and test_PrintDlgA(). Definition at line 469 of file commdlg.h. Referenced by DIALOG_FilePrint(), Display_OnPrint(), CMainWindow::OnCommand(), PRINTDLG_CreateDCA(), PrintRegistryHive(), and test_abort_proc(). Definition at line 467 of file commdlg.h. Referenced by DIALOG_FilePrint(), Display_OnPrint(), CMainWindow::OnCommand(), PRINTDLG_ChangePrinterA(), PRINTDLG_CreateDCA(), PRINTDLG_WMInitDialog(), PrintDlgA(), PrintRegistryHive(), test_abort_proc(), test_DeviceCapabilities(), and test_PrintDlgA(). Definition at line 468 of file commdlg.h. Referenced by DIALOG_FilePrint(), Display_OnPrint(), CMainWindow::OnCommand(), PRINTDLG_CreateDCA(), PRINTDLG_WMInitDialog(), PrintDlgA(), PrintRegistryHive(), test_abort_proc(), test_DeviceCapabilities(), and test_PrintDlgA(). Definition at line 476 of file commdlg.h. 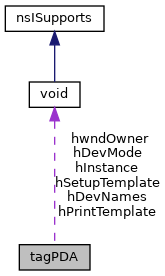 Referenced by DIALOG_FilePrint(), PRINTDLG_GetDlgTemplateA(), and PrintDlgA(). Definition at line 482 of file commdlg.h. Definition at line 483 of file commdlg.h. Definition at line 466 of file commdlg.h. Referenced by DIALOG_FilePrint(), Display_OnPrint(), CMainWindow::OnCommand(), PRINTDLG_WMCommandA(), PrintDlgA(), and PrintRegistryHive(). Definition at line 477 of file commdlg.h. Definition at line 478 of file commdlg.h. Referenced by PrintDlgProcA(), and test_PrintDlgA(). Definition at line 479 of file commdlg.h. Definition at line 480 of file commdlg.h. Definition at line 481 of file commdlg.h. Definition at line 465 of file commdlg.h. Referenced by DIALOG_FilePrint(), Display_OnPrint(), CMainWindow::OnCommand(), PrintDlgA(), PrintRegistryHive(), test_abort_proc(), test_DeviceCapabilities(), and test_PrintDlgA(). Definition at line 475 of file commdlg.h. Referenced by DIALOG_FilePrint(), Display_OnPrint(), CMainWindow::OnCommand(), PRINTDLG_ChangePrinterA(), PRINTDLG_UpdatePrintDlgA(), PrintDlgA(), PrintRegistryHive(), test_abort_proc(), and test_PrintDlgA(). Definition at line 471 of file commdlg.h. Referenced by DIALOG_FilePrint(), Display_OnPrint(), CMainWindow::OnCommand(), PRINTDLG_ChangePrinterA(), PRINTDLG_UpdatePrintDlgA(), PRINTDLG_WMInitDialog(), PrintDlgA(), PrintRegistryHive(), and test_abort_proc(). Definition at line 474 of file commdlg.h. Referenced by DIALOG_FilePrint(), Display_OnPrint(), CMainWindow::OnCommand(), PRINTDLG_UpdatePrintDlgA(), PRINTDLG_WMInitDialog(), PrintDlgA(), and PrintRegistryHive(). Definition at line 473 of file commdlg.h. Definition at line 472 of file commdlg.h.